In previous tutorials I discussed an example of entering data into a data frame and performing a nonparametric Kruskal-Wallis test to determine if there were differences in the authoritarian scores of three different groups of educators. 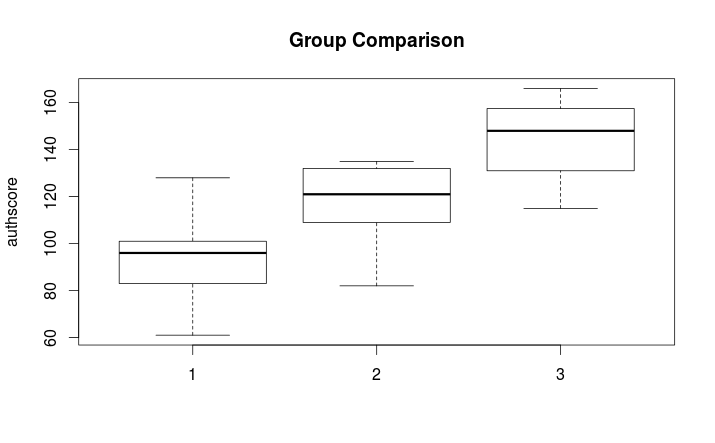 The test statistic indicated that at least one of the groups(group 1) was significantly different from the other two. The output above confirms what would be expected from observing the boxplot. The only means that differ significantly are means 1 and 3 with a p = .031. As noted earlier the comparison between groups one and three is shown to be the only significant difference at the p=.05 level. Both the PMCMR and the pgirmess packages are useful in producing post hoc comparisons with the Kruskal-Wallis test. It hoped that the series of tutorials discussing nonparametric alternatives common parametric statistical tests has helped demonstrate the utility of these approaches in statistical analysis. In part four I will post the complete script used in all three tutorials.